No show this week for the 4 of you who watch it on the web, but here: look at these awesome titles I made trying to learn the “Motion” software. Another new fake episode– tomorrow night! Only 9 episodes of LOST left until the 2 hour final finale! Then: over! Forever! Oh gosh! Gracious! Jeez! What to we do?? Well,! watch a new fake Jubi tomorrow @ 9pm on PATV 18 in Iowa City. Or whenever you goddamn FEEL like it here on the internests. See much cats, TV on TV, otherr/Furious sKinny??,. If the Tele Vision reinforces my spelling errors, what chance do the dummies have?? Set it & froget itt!! Have YOU appreciated Chapped Reggie today? And What’s the Deal with Noodles, Am I Right? 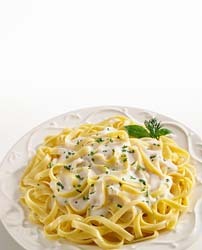 Seriously, every time I eat fettuccine Alfredo, I get the Alfredo stomach. It’s not a good feeling, it’s a bad stomach feeling. They look so good and it’s so much food and they TASTE so good, but you better watch out for about 30 minutes from when you eat them. My only other choice is to eat the Long Noodles Marinara. They’re too long, and they don’t taste as good. They’re long enough that when you wind them up on the fork, the pile won’t even fit in your mouth. Why do I get the Alfredo stomach? I don’t want to eat the Marinara. I want to eat the Alfredo. I don’t think I like pancakes either. Keep checking the post below for whenever Hans gets episode 6 working. Hopefully someday soon.